6.3" x 4.5" x 0.36"
(160 x 115 x 9.1 mm) 6.7" x 4.6" x 0.36"
(169 x 117 x 9.1 mm) 6.4" x 4.5" x 0.30"
(162 x 115 x 7.6 mm) 5.6" x 4.8" x 0.13-0.33"
With Kindle Unlimited, you can read as much as you want, choosing from over 1 million titles and thousands of audiobooks. From mysteries and romance to sci-fi and more, freely explore new authors, books, and genres on any device for just $9.99 a month. 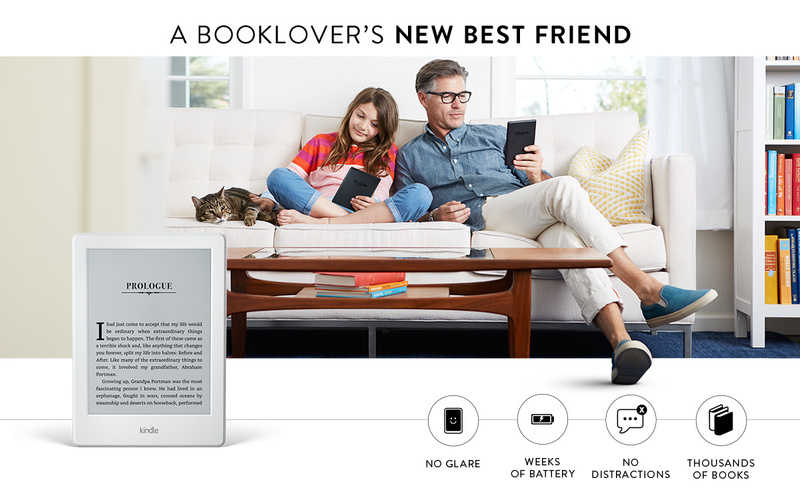 Try Kindle Unlimited free for 30 days. Kindle and the National PTA are working together to help families get more involved in their children’s reading and enhance their emerging interest in books. In support of this mission, the PTA Family Reading Experience, Powered by Kindle is available to local PTAs around the United States.